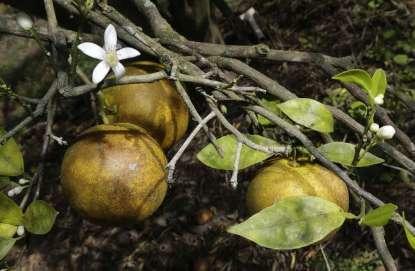 Florida’s “brand” and $10-billion economic driver, the citrus industry, could be headed for collapse if stop-gap measures aren’t found to slow citrus greening, said Agriculture Commissioner Adam Putnam. “What we don’t want to see is this catastrophic collapse of a 300,000 acre industry where you have fire sale real estate prices and you end up with a sprawl,” Putnam said. Orange, grapefruit and lemon groves once covered 800,000 acres in Florida. But Putnam said the citrus industry footprint now hovers around 300,000 acres, down more than 60 percent. Some growers have switched to peaches, blueberries or cattle, which are not as profitable. So, Putnam is concerned that the abandoned citrus acreage will lead to sprawling development in rural areas. Greening is a plant disease, a bacteria spread by an insect, that deforms the fruit and eventually kills the tree. “And we also are working on a special use permit through Washington to permit three new bactericides which will also help us buy time, assuming they’re approved in the next 90 days,” Putnam said. He added that can’t come soon enough because Florida has experienced a 75 percent drop in citrus production over the last two decades, from a high of 250 million boxes to an estimated 65 million boxes this year. And he said greening is a large reason for that decline. There is no cure for greening and researchers are diligently working to find one. That’s why the state is focusing on developing stop-gap measures until a long term solution can be found. Copyright 2016 WUSF-FM. To see more, visit WUSF-FM.